One might well have expected the outbreak of World War II to deal a shattering blow to the three-year-young American paperback industry, especially as the war was accompanied by extensive paper rationing: surprisingly, though, that turned out not to be the case. In fact, the number of Americans buying paperbacks went up during the war years, rather than down, not only because people felt a greater need of distraction but also so that the books could be sent off to soldiers at the front. Publishers printed more paperbacks than ever before and, even though the quality of the paper that was available to them became steadily worse, there were few returns of unsold stocks—an ideal state of affairs for young and small publishers. The armed forces were soon gobbling up books faster than existing firms could print them, and special wartime publishers had to be set up just to keep America's fighting men in reading material. The total number of military editions produced was well over 100 million. The mailing of paperbacks to family members in uniform was encouraged everywhere and directed by the Victory Book Campaign, a drive organized by the American Library Association and the Red Cross. Inside paperbacks, readers found messages such as: "Our Boys Need and Deserve Books. —The Victory Book Campaign asks for your cooperation. Sailors at sea, Soldiers in the Solomons, Marines in Africa, Commandos on the alert in some unrevealed jumping-off place—they all need books to read—to read for pleasure, for information, and for just plain relaxation—to take their minds off sounds and sights they're trying to stop forever. Give them books—give them this book, when you are through with it—take it to the nearest Public Library, or send it to one of the addresses below—a 3¢ stamp will do it." A black block on the back of every Pocket Book carried text reading "Share this book with someone in uniform" or "Send this book to a boy in the armed forces anywhere in the U.S." Pocket Books even thought of the prisoners-of-war: "Americans most in need of reading matter are those now held prisoners by the Germans .... Because there are many special restrictions and conditions, Pocket Books has established a Prisoner-of-War Service for the convenience of those who want to send books to American prisoners. For complete information apply to PoW Service, Pocket Books, Inc. 18 West 48th Street, New York, N.Y."
Avon Books also issued an urgent call to mail books to family members overseas: "Because the New Avon Books are easy to hold, thrilling to read and compact to carry or store in clothing bags, they are ideal as gifts to the boys in the Armed Forces." It cost 25 cents to send them, though, just as much as it cost to buy them. Reactions trickled in from soldiers, affirming that all these books were filling a real need. Pocket Books chose the most usable sentences from such letters and printed them at the back of their new releases: "If I had to choose, when making up my pack, between an extra K ration and a couple of Pocket Books, I honestly believe that I would, in most circumstances, choose the books." Or: "My division was in the invasion of Sicily and Italy. I assure you that all concerned appreciated the Pocket Books, Many a front line infantryman has carried a Pocket Book with him when going into engagements." This was all very useful and heartwarming, yet it was also obvious that the business side of wartime publishing could and should be enlarged. The more Americans sent off to war, the greater the demand for reading material. After a few years, that demand became so large that it could only be filled by a publishing venture aimed exclusively at the military market. For that reason, the Council on Books in Wartime was established in 1943 to control two nonprofit publishers: Overseas Editions and Armed Services Editions. The Council represented about 70 American publishers and many libraries and distributors; there was a three-man Executive Committee, and daily operations were directed by a Managing Committee which included Richard L. Simon and Philip Van Doren Stern of Pocket Books and S. Spencer Scott. Pocket Book's Robert F. DeGraff was also heavily involved. Van Doren Stern, who was later to become executive editor at Pocket Books, had edited several anthologies (The Pocket Reader, The Pocket Companion, The Pocket Book of America) before becoming a member of the Council on Books in Wartime. As general manager of the Council's publishing program, he decided which books were to be issued and maintained contact with the five branches of the military, fiber printers, various paper factories, 12 typesetters, and the entire membership of the Council. Other important figures were Ray Trautman, chief librarian of the Army, Isabel DuBois, chief librarian of the Navy, and H. Stanley Thompson, the graphics specialist in the Special Services Division. OVERSEAS EDITIONS were published for foreign use only; they were not for sale in the United States or Canada. The idea was to reprint recent "representative" American books and to make them available in Europe and Asia until "Axis aggression" could be put down and normal publishing activities could again be picked up. The books were slightly larger than conventional paperbacks, and had the Statue of Liberty on their covers as a colophon. ARMED SERVICES EDITIONS were set apart for American Soldiers; they were not available to the general public. There were two standard formats: 14 cm long by 10 cm high (5½" x 4") for books up to 320 pages and 16 cm long and 11 cm high (6½" x 4½") for books up to 512 pages. Books which would require more pages were "Condensed for Wartime Reading." The oblong format was not only chosen because it fit well in the pockets of uniform jackets, but also because it was economical to print. The Armed Services Editions were printed on presses which had been built for magazines, pulp novels or digest-format paperbacks; they were printed and bound two at a time and then, after binding, cut apart into two separate books. The digest-format presses printed sets of two 14 x 10 cm Armed Services Editions, the pulp-novel presses printed sets of two 16 x 11 cm books. Philip Van Doren Stern hired Sol Immerman to design the covers. Immerman's basic design was simple: a small reproduction of the hard-cover cover, a circular A.S.E. colophon, a colored band an a text. Immerman had these regular elements reprinted, then pasted the rest the design around them. He earned $10 per cover. In the five-year existence of the Armed Services Editions, a total of 1,322 titles were issued (it took Pocket Books 20 years to get that far—number 1322 didn't appear until 1960). The first 30 titles, numbered A1-A30 and printed in editions of 50,000 copies each—1.5 million books in all—appeared in September of 1943. Every month another 30 titles were added, with similar print runs, numbered in sequence using the next available letter of the alphabet. The books were sorted in New York City's harbor and shipped by the Army Postal Service. The Special Services Division arranged for further distribution: sometimes books were transported by plane and dropped to their destination by parachute. 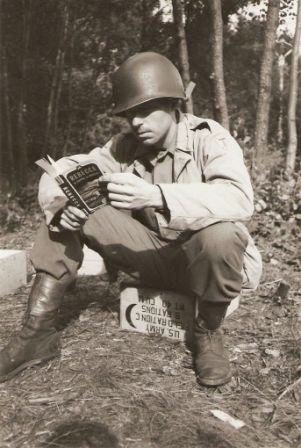 Beginning with the L series (August, 1944), the books were distributed within America as well, to the many soldiers confined to hospitals there. Meanwhile, the print run per title had gone up to 155,000 copies and the number of titles had risen from 30 to 40. Most Armed Services Editions were reprints of novels or collections of short stories, poetry, political essays or war journalism, provided by the 70 participating publishers. Some collections were compiled especially for Armed Services Editions, including volumes of stories by Stephen Vincent Benét, Katherine Mansfield, Paul Gallico, Edgar Allan Poe, Thomas Mann and Ernest Hemmingway. As of May 1945, from four to six previously-printed Armed Services Editions were reprinted in each new series of 40 titles. Publication of the Armed Services Editions continued for a while after the end of the war. Beginning with number 1179 (October, 1946), the series was printed using the standard Pocket Books format, which proved more economical for editions of "only" 25,000 copies. The last title, Ernie Pyle's Home Country, appeared in September 1947. 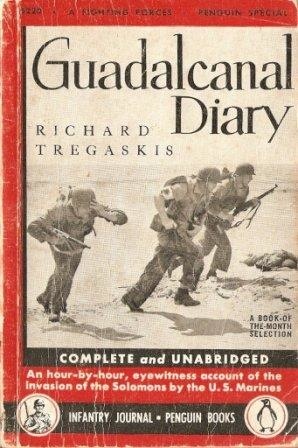 A few other publishers active during the war years deserve mention here. Penguin Books and the Infantry Journal, a magazine which was published in Washington, D.C. for circulation to the American Army, worked together early in 1942 on the production and distribution of a series of paperbacks. As of June, 1944, the Journal also published about 75 paperbacks of its own. These were "standard military books," dealing with war-related subjects; 17 of them, the FIGHTING FORCES SERIES, were, like the Armed Services Editions, only available to military personnel. INFANTRY JOURNAL BOOKS, established as a separate series in June of 1945, did not last very long. Only two titles were released: Boomerang/Baby Fights Back by William Chambliss and The U.S. Marines on Iwo Jima. In November of 1944, the Military Service Publishing Company (Harrisburg, Pennsylvania) initiated a paperback series, the SUPERIOR REPRINTS, in cooperation with Penguin Books. The books, which resembled Penguins, were reprints of easily-digestible novels by, among others, Faith Baldwin, Philip Wylie, Frank Gruber and Elizabeth Daly. Because of the paper shortage and because they were not war books, the Superior Reprints could not be issued with the regular Penguin series. Six titles appeared in 1944, 15 in 1945. In September of that year, the series was discontinued. By the end of the war, the public had become used to buying paperbacks. the earlier idea that "real" literature could only be bought at a bookshop, and not at a supermarket or a station kiosk, had disappeared. In America and abroad, it was clear that there was indeed a mass audience for paperbacks: publishers had only to look at the enormous total of almost 123 million Armed Services Editions in circulation. A seed had most definitely been planted and, in the late '40s and throughout the '50s, paperback publishers would eagerly reap the resultant fruit.